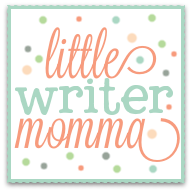 Little Writer Momma: When Momma Blows Her Lid! When Momma Blows Her Lid! Oh friends. You should have seen me last Saturday afternoon. No. Actually, I'm really glad you didn't see me last Saturday afternoon. Blubbering, crying, slamming doors lost it. If you're thinking, Oh my goodness, she doesn't look like that type. The blubbering, lost it, slamming doors type! You'd be right...most of the time. I credit my faith, God's grace, and a somewhat consistent prayer life for helping me to hold it together most days. I'm relatively patient with my kids. I don't do a lot of yelling because I am starkly aware that I DO NOT want my girls to remember me that way. And I rarely, if ever, slam a door in the house. But, life got the best of me on Saturday. Actually, the house, the cleaning, the STUFF!, got the best of me. I had spent the entire morning cleaning the house-- picking up toys, putting laundry away, cleaning the kitchen, and sorting through CD's, DVD's and books in the living room. The CD/DVD project took longer than I expected, and Aubrey (as 2 year olds are prone to do) started to dump other stuff (her toys, puzzles, games) all over the back of the living room. At this point I was still holding it together though. Ok, ok. I've been preoccupied, this is not her fault. She's just playing and doing what two year olds do. Lots and lots and LOTS of what two year olds do. I continued my organizing project, eventually sent the girls up to clean their rooms, which they did half-heartedly in about 10 minutes time, we ate lunch and the girls settled on the couch to play a Wii game. It was getting late in the afternoon and I knew that I still had errands to run--for Birthday parties, Valentines stuff, grocery items-- more to do than I realized I had time for. The tension was starting to mount. I was still purging and organizing the back of the living room and our window seat, whose internal contents had become a haphazard dumping ground for puzzles, games and toys, and was feeling increasingly frustrated. "Ava, Ella!" I shouted, as I pulled dozens of games and puzzles out of the window seat and started throwing them into a pile on the living room floor. "I need help!" They completely ignored me and continued to play Mario Brothers. "Girls! This is NOT MY STUFF! I spend all of my life sorting it and I'd like some help!" "Mom," Ava said, somewhat sarcastically, "It doesn't ALL need to be done on Saturday!" And that's when I blew my lid. "Turn that video game off now and get back here and help me!" They did't turn it off fast enough. I marched over, hit the power button on the television, sent Ava up to her bedroom and then proceeded to pull the rest of the games out of the window seat, throwing them on the floor, one at a time while my six year old watched with her eyebrows raised. Oh my goodness, I'm damaging my six year old for life, I thought as I continued to angrily throw puzzles. I finally sent her upstairs, more calmly, because she at least asked if she could help. I realized I needed time to cool off without bystanders. But before my cooling off would commence I marched my angry self up the stairs behind her, told Ava to never, EVER talk to me like that again and then slammed her door shut. I went back down to the mess of games and puzzles, sat on the window seat, and cried a few crazy mom tears before Scott found me and tried to talk me off the ledge. He reassured me that, a) I wasn't crazy, b) we don't have a ton of time for ourselves, c) this parenting gig IS harder than we ever imagined it would be, and d) that he supported my efforts to purge and to ask for help in the process. Scott invited the girls back downstairs where they apologized for not helping and for their snippy tone about the house cleaning. I wasn't ready to apologize for my door slamming (that would come later), and simply accepted their apologies and offers for help. Sadly, my tone sent Scott on a grumpy, downward spiral for the rest of the day. Just about the time that I started to regain my composure, patience and stamina, he was throwing paint brushes around the kitchen and barking about his own (understandable) frustration. The day felt like an epic family fail. This was not how we envisioned our lives as parents, or how we thought our family Saturdays would go down. The reality is that sometimes we just have bad days. Sometimes the pressure cooker of parenthood pushes you to your limits. Sometimes you collectively throw puzzles and paintbrushes all on the same day. But, God...God is good. He redeems the mess...the figurative and the literal and can turn it into good. We pulled the pieces together that night; apologized to the girls, apologized to each other and made promises for a new, good and better start the next day. 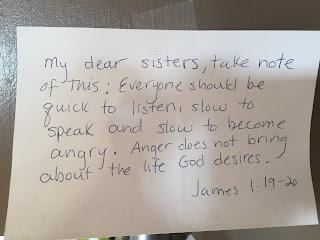 The next morning, while the girls were still sleeping and I was fixing my morning coffee, I happened to glance up and read this verse that has been taped to the side of our kitchen cabinet for months. It was a convicting reminder. 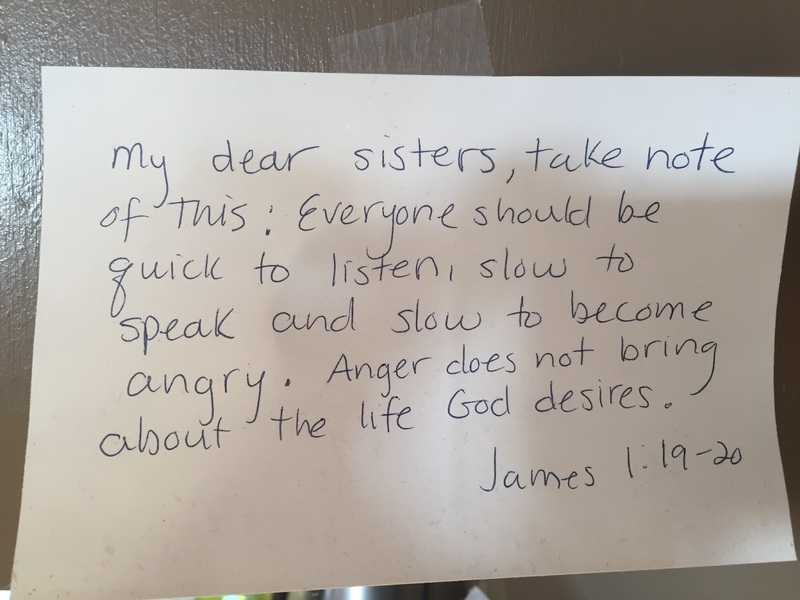 I laughed at the irony that I had boldly tapped it to the side of the counter during a time when the girls bickering with one another was getting out of control and I was tired of being a constant referee. I called my husband, who was on his way to church to play on the worship team that morning..."Babe, I just read this verse! The last line...it got me. Remember last night how we said we felt like we were not living the lives we wanted to live...we weren't!" When the girls got up that morning I read the verse to them and apologized, again, for my angry behavior the day before. I explained that it's ok for mom to ask for help, and that they need to be respectful in their responses, but that my choice to slam Ava's door in anger is never, EVER what we do when we're mad. "Girls, was that a good choice or a bad choice...the slamming of the door?" I asked, somewhat sarcastically and in my best teacher voice. They smiled. "Bad choice, mom." I realized I had been slow to listen and quick to speak during my Saturday purge. The reality is that a family of five does need to work together, and Ava, of course, should help when I ask (and not be sarcastic! ), but there was a bigger picture lesson going on here. In the midst of the mess, and the busyness, and the striving to get it all done, I let my focus on a clean house take me away from my focus on a clean heart...one that accepts that "full" and "messy" are part of this season we are in, and gracefully works through the details of decluttering and cleaning one day at a time, often at a pace much slower and more laborious than I would like! The reality is, and I can hardly believe I'm saying this, that Ava was probably right...It did't all need to be done on Saturday. We did finish our living room purge and I got most of my errands done. And, better than all of that, God was doing a deeper work in my heart that day...I vowed to never, ever slam a door again (I'm hoping I can hold true to that one! 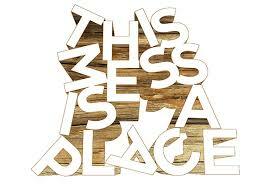 ), and to listen more and say less. So, we venture on. One messy, grace filled day at a time. 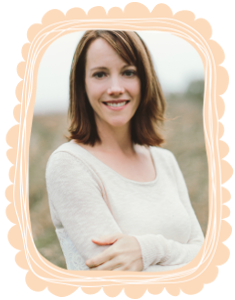 Digging deeper into what really needs to be purged (the living room or our hearts! ), and are thankful for grace in the process. 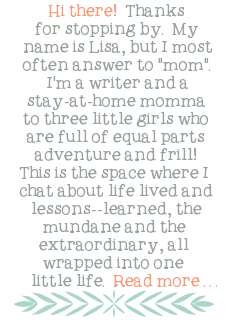 I love this post, Lisa. What a great reminder of living out grace in the chaos!